How does a person lose weight safely and quickly? This program works by putting you in a “fat burning state”. This is more technically known as a very mild “dietary ketosis.” Ketosis is a stage of metabolism where your body has depleted the reserves of its main form of energy – glycogen. Once those reserves are gone, your liver will begin breaking down stored fat in the body for use as energy. Breaking down the fat yields fatty acids and three types of ketone bodies (hence, the name ketosis). The ketones are then burned by the cells in your body as an alternative fuel. Arguably, the worst part of being on the program is getting into FB. Our bodies have done what they’ve always done for millions of years – they’ve adapted to life as they know it. Our lives have led to us being overweight by indulging in bad foods in bad quantities. Our bodies are now used to that type of existence. Introducing a new nutritional paradigm (ketosis) to our bodies will necessitate it’s adapting to the new condition. This adaptation is stressful for the body and we will feel the effects. Hunger – you’re going to feel hunger because your body is used to having more than it has now. Not atypical for dieting in general. Headache – some report headaches associated with “carbohydrate withdrawal”. Whether it’s truly withdrawl or not, we don’t know. However, it certainly seems that way to those who suffer its effects. The typical headache relief methods (ibuprofen, acetaminophen, aspirin) are allowable while on the program, however your stomach may seem more sensitive to them because it’s no longer loaded with food. Try to use such products soon after having a meal and drink plenty of water. Irritability – when you’re hungry, tired and/or have a headache…you can be understandably irritable. Try to keep in mind that you may be more inclined to react negatively to things during this short time and don’t go off on those who don’t deserve it. THE GOOD NEWS is that this transition generally lasts only 2-4 days. Once you’re in FB, you’ll feel a difference in your energy level. 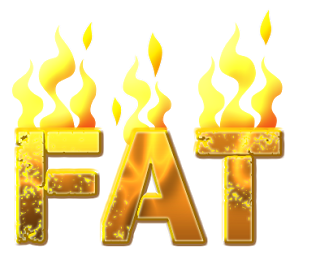 It will go up significantly as your body begins to enjoy having an alternative fuel source – FAT STORES! As the ketones pervade your bloodstream to supply the cells with energy, your state of FB begins to manifest some side effects. Some of those side effects are disquieting, but they’re not bad for you. Ketones will show up in your urine, which are sometimes able to be detected with Ketostix, but the state of ketosis that our program evokes is so mild that often such tests won’t show a positive result on the Ketostix. One of the three types of ketones is permeable to the lungs and can pass from the blood through the lung walls and becomes incorporated into your exhalations, the same way that carbon dioxide passes out of the body. This can cause “ketosis breath” and a slight metallic taste in the mouth. This is unpleasant, but can be easily overcome with frequent brushing of teeth (a few times a day) and sugarless gum/mints. A woman’s cycle can also be affected while in ketosis. Your cycle may be disrupted or cease all together. While this is an odd occurrence for a woman, it is not completely unexpected while in this state. You may occasionally feel hunger while in FB, but it should be more mild than normal. Since you’re eating every few hours, you shouldn’t feel that gnawing sensation associated with hunger prior to being in ketosis. As your body adapts to the new circumstances, it may even develop an internal clock that will make you mildly hungry right around meal time. For most, there is no hunger at all and people need to remember or even be reminded that they need to eat! Hunger – your body will assume that since you’re getting enough carbs to end FB, there must be ample food available. Coming out of FB and having food available is exactly the type of situation that the body has adapted for over the millennia – “Feast or Famine”. Now, it sees it as a time to feast so that you can replenish the glycogen that you depleated while getting into FB. That replenishment requires more fuel – more food! Therefore, your body tells you to eat, eat and eat. You’ll be almost insatiably hungry. Immediate and dramatic weight gain – As your body restores its glycogen, you’re gaining weight…quickly. Several pounds in a period of a couple days is not uncommon. If you fall out of FB for some reason, the best thing to do is to start working to get right back in it. Follow the program as if you didn’t do anything to fall out. If you “cheated” and had a candy bar or a hamburger or whatever, resume the program as if you hadn’t had it at all. Keep on your meal schedule and get in your 5 MF meals and a Lean and Green. Don’t abandon the day, weekend or week by just giving up on it because you’ve “screwed it up”. Just get right back into the program immediately. Doing this helps to significantly reduce the amount of time it takes to get back into FB. The longer you stay out of FB, the longer it takes to get back into it. So, hop right back on the wagon!